All of the food. All of the magic. "Verbena has been a career long dream of mine. I’ve always worked towards a single goal: to be better today than I was yesterday. Until recently, I’ve only repeated one dish in a professional kitchen. Verbena is the platform for me to express an unwavering desire for new ideas, new flavor combinations, new methods, and new people. Key employees and key ingredients remain within the growth spectrum and are pushed towards their own limitations in order to show them that they are better than they originally thought. I’ve seen line cooks that have worked for me become successful restauranteurs, successful chefs, and better people overall. Watching that growth gives me the sense of nurturing and refinement that very creative and meticulously detailed people seek. Removing barriers, breaking old habits, and restructuring the existing into something better is the goal. It’s not just a piece of fish, it’s not just a cup of coffee, it’s not just any mundane day of the week, It’s something special. Always. We look for great things in order to provide great things. I have roughly 40 chairs and 365 days a year to make an impact. However those aspects are received or whatever that means to someone, is something notable. Life interacts with a kitchen. Life gets in the way of life sometimes, that “just” happens. What we do with those moments, those snippets of tarnish as well as those with glow, are determined by how and what we have learned. The best cooks make mistakes. The worst cooks grow. Balance is achieved. When balance is achieved, consistency can be maintained. We (I) will never say that day one was my best, that’s foolish and unrealistic. I will say that on any given day I will never stop pursuing my own personal best. I pray I never reach my potential. I never want to plateau. Even now, I strive for a better dice, a cleaner reduction, transparent braising liquids, employees with less stress, a strong work ethic instilled by the collective group, and a growing network of higher caliber professionals. I don’t settle. I accept. I set out to find the best kitchens I could locally, none of which were any good. I am from a very small town in Delaware County called, Aston. Until recently, food and cuisine had not been on anyone’s mind or at the fore front of any movement. It just doesn’t exist yet. I’m very proud of where I come from because we help our neighbors and I carried this along my journey and never knew it. I cooked in every bad kitchen I could tolerate. There had to be something better. I worked endless hours cutting my teeth. I continuously made contact with as many people as I could, becoming well versed with the phrase “everything happens for a reason." I met a young Chef ten year my senior. He was cocky, precise, and new how to retain a phenomenal set of cooks. Impact. My first real kitchen. My first real gig. I was going to rehab in the morning and working 14 hour shifts until 2am. I would go to the rehab facility at 7am. After an hour of recovery talk, which for anyone who’s been there, well, you know…I would start my shift between 9 -10am. Except for the occasional unfriendly knock on the car window from Chef if I had falling asleep. No excuses. Ever. Verbena was a long way off in the future. I couldn’t visualize it yet, but it was there. A sort of misty vision, a thought with colors. I knew I had to change my life. The Chef in front of me hated how bad I was and I loved him for it. I knew the next ten years was going to hurt and I didn’t care. I made next to nothing. I didn’t care. I wanted to be better. Somehow, I knew if I found something remotely close to being good, I could double down on myself, and one day I would be able to stand in my own kitchen and cook nice food. Food that causes knee jerk reactions, smiles, deep breathes, and the occasional culinary joke. Impact. Those ten years, ha! I wouldn’t trade those experiences for anything. Not the bread being thrown at me on my day one, not the first promotion in a major kitchen, or being around some of the best people, some of which I still keep in touch with today. My goal was to surround myself with the best people doing the best things. Wanting more is very different than doing more because you actually have to do it. There’s no faking it. I had to go with what I was good at doing. That became kitchens. That became the dream. So, after a few long weeks, countless pots of coffee, an endless stream of my own signature on every shape of paper the mind can imagine, I am another day closer to the once misty vision. The one with perfectly cooked fish. The platform for me to relearn values as well as teach them. That same dream of neatly arranged kitchen equipment measured within a quarter of an inch tolerance. That picturesque mosaic of personalities buzzing around my restaurant with ghost like finesse. I want my restaurant to progress as much as I did. I want my restaurant to become progressive, but to never lose sight of what we are actually doing. Over the past few months I knew someone at some time would ask me about my story. And all I could think about was butter fried capers, crisp organic chicken skin, a wicked floral scented soda, a myriad of curveballs that only a few people will catch. The awkward(s). The rough necks pushing to refine. A mirror edge on soft carbon steel. Those sounds that only exist in kitchens. The cooks that actually talk to the food they are cooking. I sit here at 2am just to answer a simple question that someone asked me. “What does Verbena mean to you”? I hope I get to present that answer for a long time..."
Sample Menu of Past Dishes…. Menu subject to frequent change. Ancho Marinated Shrimp, Seared Lady Apple, Lobster "soy sauce"
At Verbena, we present refined American Cuisine in an intimate setting. We offer our guests a high standard of dishes and only serve 40 seats in our dining room. We source our products locally whenever possible. As we grow, we will present our guests a continuous evolution in fine cuisine. Our Culinary Creativity At Work. At 39 years old, Scott Morozin holds a monumental presence within the food industry, even when he’s not running the pass. His culinary prowess commenced at age 24, where he attended the Culinary Institute of America, one of the most renowned cooking schools in the world. Upon graduation, culinary wonder Steven Starr, brought Morozin to Philadelphia to work on the line of the prestigious kitchen and Mediterranean masterpiece, Tangerine. There, Morozin acquired his influence of cooking in a high volume kitchen, but also found his true passion; cooking. Mediterranean cuisine was calling, which led Morozin to another established fine dining restaurant, Espuma, where he flourished under master Chef, Jay Caputo. It was at this time where he further pursued his favorite oceanic ingredients by crafting elaborate plates and further maximizing his culinary talents in such a reputable restaurant. Chef Daniel Stern, another distinguished culinarian, recognized Morozin’s prominent inventiveness and made him Sous Chef at one of his very own exclusive restaurant’s, Gayle. Prior to the closing of the restaurant, Scott’s genius expertise in cooking gained recognition, which led to him being apart of Stern’s team in the the opening of two skyline establishments in Philadelphia, Mid-Atlantic and R2L. An opening of a new restaurant is never easy, especially for a chef, but Morozin managed to prove himself under pressured environments and created some of his greatest plates by working with different types of food. To further broaden his knowledge, Chef Morozin decided to showcase his culinary gifts by working four times as Sous Chef under Jay Caputo at critically acclaimed, James Beard House. His advanced mastery as a chef led him to other kitchens as both, Chef de Cuisine and Executive Chef, featuring respectable cuisines. Despite working in one of the most competitive industries in the world, Morozin’s career truly blossomed as he obtained high-profile positions that were only given to the truly dedicated. “Cook with heart and soul and everything else will fall in place” said new restaurant owner and executive chef, Morozin. To his beliefs, being an accomplished chef is more than just being passionate and talented in this line of work. His code in the kitchen does not only entail superb cooking flair, but it embodies the need for respect, fairness, and patience, which many can not obtain. Morozin has built a credible reputation from the ground up, which any aspiring chefs can learn and hope to be apart of. 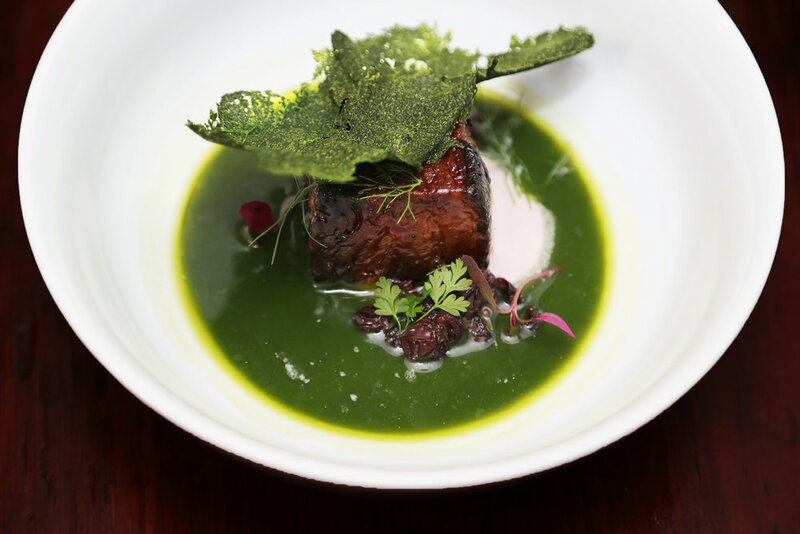 Now, with a restaurant of his own, Morozin finally gets the chance to design and curate the plates he could only dream of when he worked under incredibly talented chefs as a young line cook. Verbena Byob, once La Madera Bistro located in Kennett Square, PA, offers a seasonally inspired menu while taking advantage of local farms and organic produce. The talent, passion, and originality are heavily woven inside each plate and take your tastebuds on an authentic journey to keep you coming back for more. If you prefer to make a reservation by phone or have a party of (6) or more, we ask that you please call. Verbena Byob would love to be the host of your upcoming special occasion. Our kitchen can deliver personalized tasting menus to accommodate all of your guests, while featuring excellent event space & service. © 2018 SMorozin Restaurant, LLC. All Rights Reserved.